These advances are ushering in a new era for replacing animals in drug discovery and development. And the good news about organ chips just keeps on coming....We want to demonstrate the possibility of leveraging microengineered physiological organ models to challenge a century-long tradition of using animals as human surrogates in life sciences. 2015 has proven to be quite a year for progress in organs-on-chips. 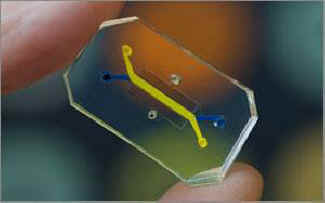 These tiny devices, no bigger than a computer memory stick, are lined with living human cells in a miniaturized biological environment that simulates real human physiology. Several drug companies, like Merck and Janssen, have signed partnerships with biotech firms that manufacture organ chips, acknowledging that animals fail to adequately model human medicine and biology. These advances are ushering in a new era for replacing animals in drug discovery and development. And the good news about organ chips just keeps on coming. This month, scientists at Harvard’s Wyss Institute and University of Pennsylvania have announced three new chip designs that simulate the human gut, the human eye, and human lung function. These innovations open the door to studying diseases like inflammatory bowel diseases, chronic dry eye disease, asthma and COPD. All without using animals. We want to demonstrate the possibility of leveraging microengineered physiological organ models to challenge a century-long tradition of using animals as human surrogates in life sciences. But Dr. Huh is correct. It is a challenge. Animal research is a multi-billion dollar industry. Many scientists, companies and institutions – including government – sustain established programs and careers based on animal research. They are not about to give it up, despite the new technologies. Which is why I started CAARE. Because I know that it will take more than innovations in science to end the standard of using animals in research. It will take a movement. CAARE works daily to deliver the best and the latest information on breakthroughs in science and medicine that don’t harm animals. We empower people to speak out credibly and intelligently for more humane, reliable and accurate science. We educate journalists, scientists and legislators so they can be knowledgeable too, helping to dissolve the cloak of misinformation that surrounds animal experimentation. Our frequent action alerts provide a platform for compassionate people to speak up. But none of this comes free. Your contribution for as little as $5 or $10 will help us to keep going. CAARE demonstrates every day that research without animals is not just some hypothetical goal, but is happening right now in universities, labs and corporations around the world, yielding exciting new results that surpass animal research. Our message to the world is that it’s time to stop apologizing for animal research as a necessary evil. CAARE is opening the door to a widespread understanding of the new and more humane way of exploring medicine and science. It can be done and we are at the forefront of promoting that message. Can I count on you to make a $10 contribution today to help CAARE grow stronger and more effective? More funding will enable CAARE to conduct far more research than we currently can with our small but dedicated team. We want to place more ads, online and in mainstream media, send more news releases, do greater outreach and educate far more people. With your support, we can smash the myth that animal research is necessary for medical progress, and expose the cruel and painful world of animal experimentation.